You've now added High & Right Comedy Night to your itinerary. 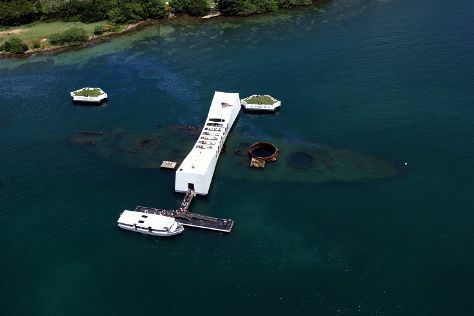 Get some historical perspective at USS Arizona Memorial and Battleship Missouri Memorial. Step out of Honolulu with an excursion to Kailua Beach Park in Kailua--about 32 minutes away. And it doesn't end there: enjoy the sand and surf at Waikiki Beach, see the interesting displays at USS Bowfin Submarine Museum & Park, contemplate the waterfront views at Hanauma Bay Nature Preserve, and take in the pleasant sights at Diamond Head State Monument. For where to stay, maps, reviews, and tourist information, you can read our Honolulu itinerary planner. Washington DC to Honolulu is an approximately 13-hour combination of subway, bus, and flight. You can also fly; or do a combination of train and flight. The time zone changes from Eastern Standard Time to Hawaii Standard Time, which is usually a -5 hour difference. In August in Honolulu, expect temperatures between 88°F during the day and 75°F at night. Cap off your sightseeing on the 25th (Sun) early enough to travel back home.